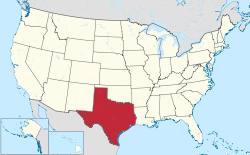 Texas is a state located in the Southern United States. There are 962 cities in the sections below. In Texas, cities are either "original law" or "home rule" cities. Cities governed under general law have only specific powers granted by state law. A city with a population exceeding 5,000 may seek home rule status by voter approval (and will maintain said status even if the population later falls below 5,000); said status allows more flexibility in local governance (those cities have powers not otherwise prohibited by the Texas Constitution or state law). Although some municipalities in Texas refer to themselves as "towns" or "villages", these names have no specific designation in law. City with portions spanning across counties. Population figures based on 2017 census estimates. David G. McComb (2015). The City in Texas: A History. University of Texas Press. ISBN 978-0292767461. ^ As of 12 December 2014. ^ "Population Estimates". United States Census Bureau. Retrieved October 27, 2018. This page was last edited on 12 April 2019, at 02:47 (UTC).